What happens when that necklace becomes more accessible to you? Would you wear it more? I HOPE SO. This choker is my new favorite piece. We launched it to kick off the summer and I wear it whenever I can. Almost never for formal occasions but always with my casual wear. Personally, I think it’s a perfect piece to layer. The back of it has an adjustable clasp so you can change up the length to work for your neckline. At Diamond Nexus we use Nexus DiamondTM Alternatives, which cost about 80% less than diamonds and come without the environmental and human concerns. People ask me all the time “can anybody tell the difference?” The answer is NO. A jeweler with a loupe wouldn’t be able to, so none of your friends will either. In fact, it will likely look better because Nexus Diamonds simulate the look of a D, internally flawless diamond whereas most tennis necklaces and bracelets using mined diamonds would be of lesser (darker or included) quality. 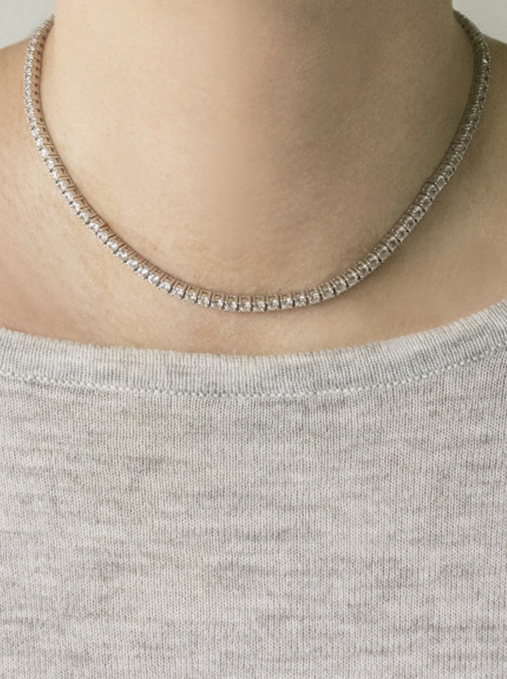 Because the stones cost so much less than mined diamonds, this necklace becomes so much more accessible. It’s still fine jewelry, made with 14k gold and set by hand. Since it’s so much more in reach for our millennial budgets, I figure it should be WORN. Why hide it away in a jewelry box? It adds oomph to simple outfits and makes me feel so confident when I put it on. So, no, my last name isn’t Kardashian, but I definitely reach for this necklace on any given Wednesday.